Based on his Earl Grey & Lemon Gin, the Heston from Waitrose Fruit Cup is full of fruity blackcurrant, fragrant elderflower and citrusy bergamot aromas, with a kick of apple spirit. Perfect for mixing a quintessentially British cocktail. Try garnished with fresh rosemary and lime zest. In a tall glass, place the raspberries and some peeled, fresh, sliced ginger. 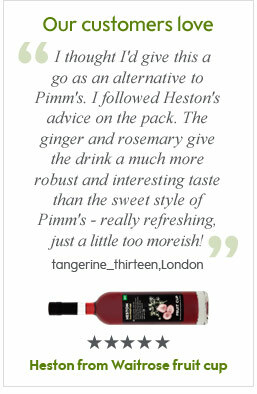 Mix the Heston Fruit Cup with the ginger ale, stir gently. Add lots of ice and a squeeze of lime. Garnish with fresh rosemary and lime zest. Selected stores. Subject to availability. Minimum online spend applies. Prices may vary in Channel Islands and concessions. Excludes little Waitrose, motorway service stations, Welcome Break and petrol stations.Offer ends 30 June 2015. 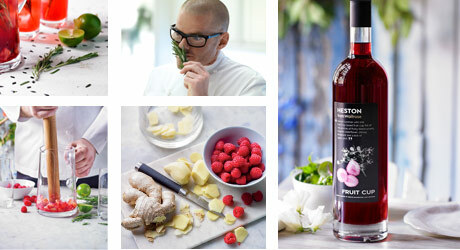 Heston from Waitrose Fruit Cup 70cl, was £21.35 (£30.50/litre), now £12 (£17.14/litre). 18+ to purchase alcohol.